The job of an IT admin is never ending with the next problem to be solved or task to be completed just around the corner. Organizations have tried to ease the burden on their IT admins by adopting new technologies. While chatbots have been successful at saving IT admins time other technologies such as software as a service (SaaS) have added complications require more of their attention. 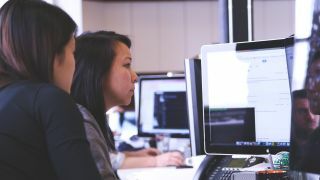 To better understand the problems facing today’s IT admins and how SaaS backup and other new workplace technologies fit into their workflow, TechRadar Pro spoke with AvePoint’s Product Marketing Manager Hunter Willis. What problems do IT admins typically encounter on a daily basis? IT admins are faced with all sorts of tasks, and everyone that I talk to in IT almost always feels overburdened — like they are putting out fires all the time. On the service side of things, they are fixing end user issues and errors; fulfilling requests for access, services, and applications. On the technology side, they are simultaneously fixing broken applications and handling data recovery requests. On top of all of this they have to find time for higher level tasks such as data migration, software implementation, end user training, and application development. Has software as a service (SaaS) reduced the workloads of IT admins and if so how? In some cases, but in general, what we see is a similar workload. Sometimes even an increased workload for areas like content and permissions management and end user requests for access to content and applications. Users getting increased productivity and using applications more also can mean more settings and security to correct, and much more problem solving. However, SaaS has provided but a much greater return in end user functions and productivity for the amount of work being done. This is particularly true right now, as with the cloud transition, many IT admins are having to learn new roles or re-learn how to fulfill their responsibilities with new applications-all while continuing to fulfill their day to day responsibilities. Are employees embracing SaaS or are they having a hard time moving on from traditional applications? For most of the customers who have migrated to Office 365, we typically see continued use of Exchange Online email, and then a heavy adoption of a few select cloud applications. Organizations may find that their employees have a high rate of adoption for personal storage drive applications – like OneDrive or G-Drive – of a service for instance, but are slower to adopt other more complex tools. Chat based services are one exception, where tools like Microsoft Teams and Slack seem to have a fast adoption rate. Is SaaS backup being widely used in workplaces and in your opinion has it made things easier for those in IT? SaaS backup is most definitely being widely used across all industries. SaaS collaboration platforms typically provide lots of protection in the form of redundancy to protect against up-time failures, but few are offering a true long-term backup for data protection. SaaS backup solutions like AvePoint’s Cloud Backup are doing quite well for this very reason, and getting a cloud backup solution is strongly recommended by Gartner and other industry research organizations. Because they run on cloud engines, in general, SaaS backups are much easier to deal with than traditional backup solutions. AvePoint’s cloud backup, for instance, automatically backs up Office 365 and can be used to perform file level restores via chatbot. This is significantly easier than recreating a database or virtual machine to find and restore a few files, for example. How are businesses using chatbots to help ease the burden of IT admins? Everyday IT workers have a choice: take on the urgent, or the important. Urgent tasks often come in the form of tickets or calls that point to lost content or missing documents that are getting in the way of business. However, important strategic planning tasks like operational governance automation, learning new technologies or records management often get pushed aside to handle these tickets. Having a bot like AVA handle many of the urgent tasks gives more time for important strategic planning that drives digital transformation. Has the rise of workplace apps such as Microsoft Teams made things more difficult for IT admins? New platforms like Microsoft Teams can be a double-edged sword for organizations. Typically end users are slow to adopt tools, so when new tools are rolled out, IT has something of a grace period to learn how to govern and control them as end users slowly increase use. Many new SaaS applications like Teams are so easy to use that organizations are seeing massive adoption in just months or even weeks. This overwhelms IT teams that have not planned a controlled rollout for the solution, and they either struggle to enforce compliance to business rules or don’t know how to keep secure and to fit into their governance plan. SaaS vendors are starting to adapt by providing early releases to administrators in their testing environments months before features are out to the production environment. What advice would you give to businesses looking to boost the productivity of their IT teams? IT teams need time to collaborate, time to plan and resources to handle change management. IT teams should also be given more leeway to invest in tools that are not only designed to increase end user productivity-but also designed to reduce IT burden from tedious tasks that arise daily in the modern workplace. The less IT has to worry about on a day to day basis, the lower they can keep their operating costs, and the more they can directly and strategically assist organizations as they move forward with digital transformation. In addition, organizations and IT teams both need to heavily focus on relationship and trust building at the employee level. For any implementation, ask the question, “Where did the idea to buy a product come from?” If IT has had no say in the implementation, then the question of how the new solution interacts or overlaps with existing functionality may not have been addressed. For reducing software spend and reducing risk, it’s very important that IT and decisionmakers have good communication. Conversely, it doesn’t do anyone any good when the business users and the IT teams all hate and blame each other. It isn’t as common as it should be, but there are actually companies where users actually LOVE their IT teams and their business productivity tools. This should be the goal for every organization. When everyone works together, business processes operate smoothly, and users and IT teams work together to quickly overcome challenges.